Are you all having a fun Labor Day Weekend? 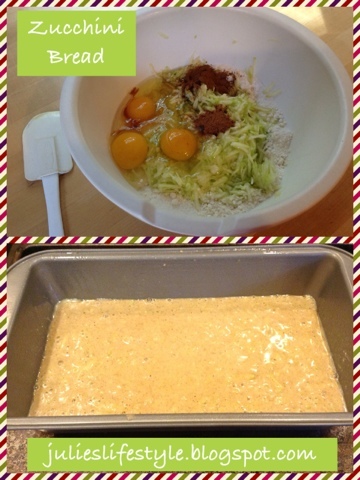 Summer is coming to an end and I wanted to share with you a super easy recipe for Zucchini Bread. Here is what mine looked like when I finished baking it. These are the ingredients I used with shredded zucchini. Heat oven to 350 degrees. Grease bottom only of loaf pan, 9x5x3 inches. Beat all ingredients on low speed, scraping bowl constantly, 30 seconds. Beat on medium speed, scraping bowl occasionally, 1 minute. Pour into pan. Bake until wooden pick inserted comes out clean, 50 to 55 minutes. Cool 10 minutes; remove from pan. Cool completely before slicing. Store in refrigerator. You are going to love this recipe and it was so easy and fun to make. 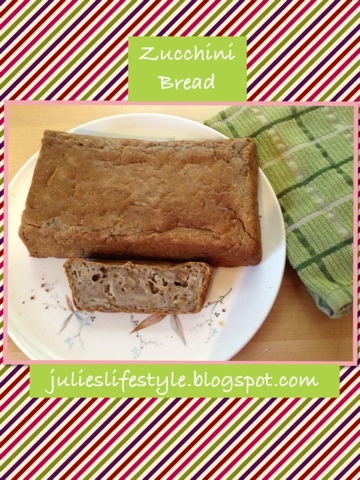 This recipe makes one loaf and let me know if you bake this and how your family liked it. Hi Emily, thanks for the follow and welcome! Try this recipe it's so good. Yummy in my tummy! I love zucchini bread, but have never made it :) I hope you have a great Labor Day. Hugs! I love that this has Bisquick in it! Makes it even simpler - can't wait to try it! Thanks for sharing! I love your blog! Hi, Jen thanks a lot for stopping by! This looks like such a delicious, simple way to enjoy zucchini bread! Great recipe, Julie! Hi Marcie, yes it is and thanks for your sweet comment. Yes, I bet it does taste great with chocolate chips and welcome to my blog. 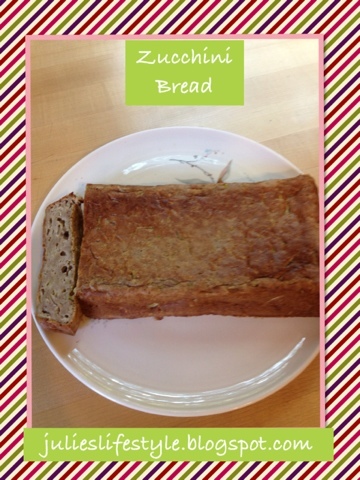 Have never had zucchini as a loaf/bread; sounds interesting! The Greeks use zucchini a lot in their cuisine and I sometimes make a zucchini quiche/pie that everyone loves. I have seen zucchini bread spiked with chocolate all over blog land. Have you heard of this? Thanks for your recipe. Would love to bake this one day. Love your Zucchini Bread, it looks great! Thanks so much for sharing with Full Plate Thursday and have a great weekend!